When you are grilling an autumn feast, don't think that the acorn squash needs to go in the oven. Instead, you can make sweet acorn squash on the grill. This squash dish makes a great side for turkey, prime rib, lamb, or duck. Try this recipe next time you have a fancy meal and you'll be sure to please most everyone. This recipe uses the indirect grilling method to bake the squash on the grill. You can set up a charcoal grill so the coals are to one side and then grill the squash on the unheated side. For a gas grill, turn off the flame on one side. Depending on your grill, you might be able to turn off the back or front rows of flame, or it may have controls for each side. An alternative way to grill indirectly is to place a drip pan under the squash. This could be a cast iron drip pan or a disposable aluminum drip pan. This will also catch any drips of the sweet filling of the squash. A third variation is to wrap the squash in aluminum foil to grill them. Cut the acorn squashes in half. Remove the seeds and strings. To make them balance better on the grill, turn them over and cut a 1-inch strip about 1/2 inch deep (but not so deep as to get into the softer part of the squash). In a small bowl combine the butter, brown sugar, walnuts, and nutmeg. Spoon the mixture into the squash halves. Preheat grill and prepare for indirect cooking. Place the stuffed squash on the unheated portion of the grill, over a drip pan, or wrap it in aluminum foil before placing on the grill. Allow the squash to cook for 15 to 18 minutes or until it is tender. Remove the squash from the grill and serve. Depending on the size of the squash, you can serve each person one or two halves. 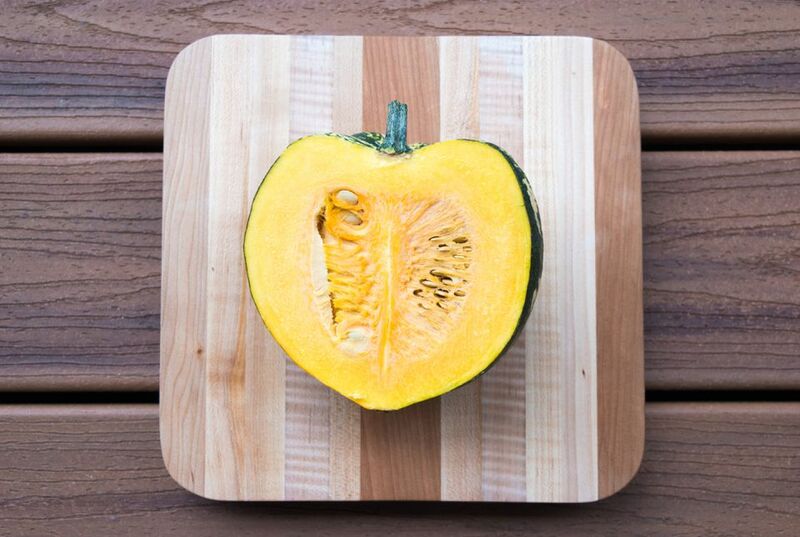 For larger squashes, you may need to cut the grilled squash into quarters after it is done. Save the squash seeds to roast for snacks. They are filled with healthy nutrients. Rinse them and lay them out on a paper towel to dry for at least 30 minutes, or put them out of the way for several hours (or even overnight). When you are ready, sprinkle them with melted butter and salt and toast them on a baking sheet in the oven at 275 F for 15 to 20 minutes. If you have a smoker, you could smoke the squash. It's great in soups and stews. Smoked Acorn Squash: A Great Side Dish or Addition to Soups!